Former Argentine President Cristina Fernandez de Kirchner waves to supporters as she leaves a Justice building where she attended court to answer questions over a probe into the sale of U.S. dollar futures contracts at below-market rates by the central bank during her administration, in Buenos Aires, April 13, 2016. Argentina's former president Cristina Fernandez accused the government of political persecution on Wednesday after testifying in court about alleged irregularities at the central bank that occurred under her watch. In a defiant speech outside the federal court in Buenos Aires, Fernandez addressed tens of thousands of supporters who showed up in the rain to cheer her on, beating drums and singing: "If they touch Cristina, we're gonna create chaos." "They can call me to testify 20 more times. They can imprison me. But they will not be able to silence me," she said. Fernandez, who was constitutionally barred last year from running for a third consecutive presidential term, is a divisive figure, revered by many for generous welfare programs and reviled by others for economic policies such as nationalizing businesses and currency controls. She was called to testify on Wednesday about charges against the central bank for selling U.S. dollar futures at below-market rates during her presidency, costing the government billions of dollars. The 63-year-old former president said the bank's actions were legitimate and the case against her was an "abuse of judicial power." Fernandez attacked President Mauricio Macri, who has implemented a string of unpopular austerity policies since taking power last December, such as a steep currency devaluation and cuts in gas, power and transportation subsidies. 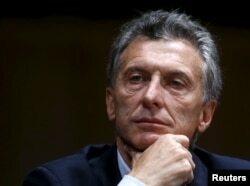 "I never saw so many calamities in 120 days," she said in an impassioned speech broadcast live on Argentine television. FILE - Argentina's President Mauricio Macri smiles during a news conference in Buenos Aires. Macri says these measures are necessary to reduce the ballooning fiscal deficit and attract the investment needed to reboot Latin America's third-largest economy. One Fernandez supporter at the rally, Gustavo Sanchez, a teacher from the northern Buenos Aires suburb of Tigre, said her presidency marked some of Argentina's best years and he lamented the change in government. "Students come to school poorly fed because their parents can't afford good food with the cost of water and gas rising," he said. Some Fernandez backers at the rally came together on buses from hours away, tangling downtown Buenos Aires traffic. In a separate case, last weekend a prosecutor accused Fernandez of money laundering. Under Argentine law, a judge still needs to decide whether to accept the charge and open an investigation. Opposition politicians including Fernandez accuse the government of pursuing charges against her to distract Argentines from the difficult economic situation and from Macri's links with offshore companies revealed by the "Panama Papers" leak. Macri campaigned partly on a promise to root out endemic corruption in Argentina and has vowed to provide investigators into his finances whatever information necessary.